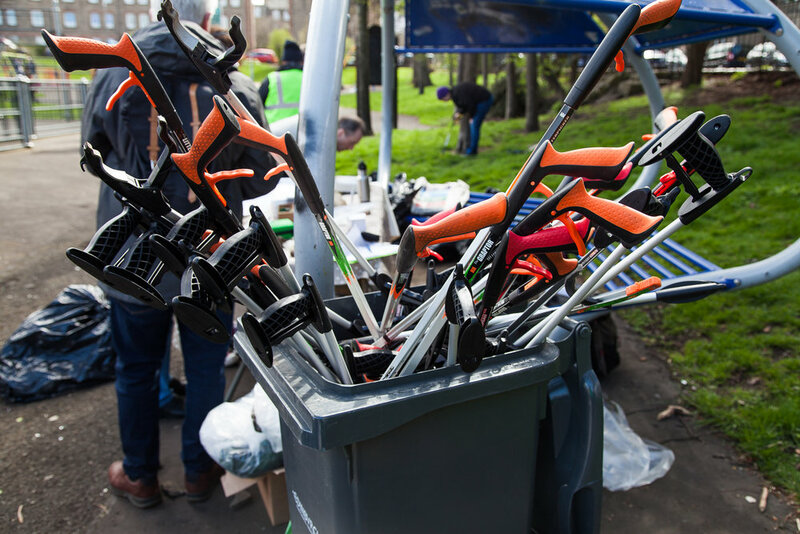 How to organise a litterpick? This is my checklist for our community cleanups in Leith. Remote areas are different from urban coastal locations and might require other preparations. Make sure you have insurance cover, or team up with an organisation that has. You can tell your volunteers that they participate at their own risk but if any passers-by trip over one of your bags and sue you, it can be a costly lesson. We have a policy with Markel, designed for volunteer groups. It costs around £100 a year. Create a mailing list. Add a “SIGN UP” button to your website and Facebook page if you have one. Make sure your collection of email addresses is GDPR compliant. This is what our form looks like. Set up an event’s page on Facebook, share it on your other social media channels like Twitter or Instagram. Add health and safety instructions. Let people know if your location isn’t suitable for children or elderly people. You can make posters for community places to promote your event. Save paper, don’t do flyers, the last thing you want to do create more litter. Get in touch with your local council. If you live in Leith drop an email to the North East Locality Team and they’ll be happy to help. Agree with them about collection points where to leave the full bags to be collected. Make sure you have the contact details of the task force on the day. Identify hazards, i.e. anything that may cause harm. Decide who may be harmed, and how. Assess the risks and take action. Make a record of the findings. Here’s an example of what a risk assessment looks like. Check the weather forecast, have an emergency way to communicate with everyone in the event of a bad weather warning. If you do a beach clean, check the tidal times. Start it with health and safety instructions. Take a group photo at the beginning when everyone is still there. Tell people where to bring the full bags. Phone the council’s task force to remind them to collect the bags. Post about your event on social media. It encourages others to participate next time. Beware! Litterpicking is addictive but it comes with loads of benefits. And loads of rubbish too. The Scottish Government’s #Seasthefuture event on 20-21 February 2019 focused on current national and international actions to protect the marine environment. FM Nicola Sturgeon opened the conference then the keynote speaker Lewis Plugh told us his fascinating story what made him swim in the ice cold waters of the North Pole. The afternoon of the first day continued with session discussions about marine litter, sound pollution, microplastic and microfibres, among others. Scotland’s Cabinet Secretary for Environment, Climate Change and Land Reform, Roseanna Cunningham opened the second day. My talk was part of the “Community Action” session. I talked about our volunteer work at Leithers Don’t Litter to encourage others that individual actions can make a difference. You can download my talk here. We’ve heard about shocking stats, eye-opening facts, great innovations but the best part of the conference was meeting lots of like-minded people, including some amazing inspirational children and young people who’re doing a tremendous job to try and save the oceans. Do you have bulky items in your stairwell or communal areas that you need to get rid of? If so, you can dispose of it, free of charge, at one of our four bulky waste containers. Yesterday we had a stall at Leith Market’s Sustainability Day to launch our Pukemons campaign. We also handed out Poo Fighters badges to promote responsible dog ownership (i.e. picking up and binning their dog’s poo). One of our four-legged supporters proudly wearing the Poo Fighters badge. We also promoted our Adopt A Street programme and gave away Sunshine booklets from our Flyspotting campaign. Meet them at Leith Market on 27th October. Our Flyspotting campaign is among the finalists at the 2018 Scottish Resources Awards in the Best Partnership Initiative category. The Awards Night is on 4th October so we’ll keep you posted.